It is important that every integrated school not only plans for developing and strengthening their integrated ethos but also engages in a process of monitoring and evaluation. The evaluation process can be supported through ‘The Excellence in Integrated Education Award (EIEA)’ which provides insight into the essential elements of a good integrated school. 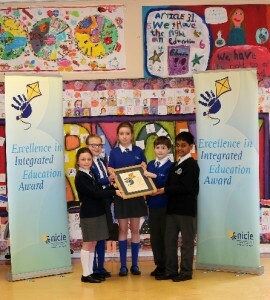 The first two schools were awarded the EIEA in 2010 and several other schools have completed the EIEA process since then and achieved the award. Fort Hill Integrated Primary awarded the Excellence in Integrated Education Award in January 2017. New-Bridge College awarded the Excellence in Integrated Education Award in June 2016. 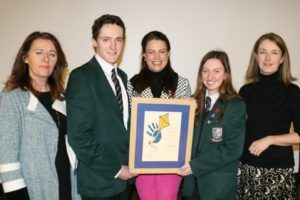 The award was presented to the school by Roisin Marshall, NICIE CEO. 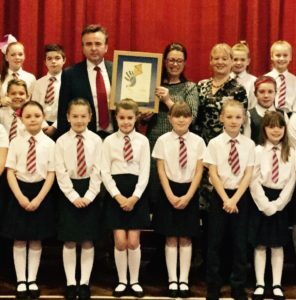 Glencraig CIPS pupils celebrating receiving the Excellence in Integrated Education Award in 2016 . Many integrated schools appreciate the value of the EIEA as an auditing tool which enables them to benchmark their progress in embedding the integrated ethos and provides a steer on how the school can fulfil the NICIE Statement of Principles. Schools should find the process useful as the audit tool has been influenced by the ‘Together Towards Improvement’ document from Education and Training Inspectorate (ETI) and linked to the School Development plan in order to provide a familiar, appropriate structure.